How do I upload historical course completion data with a CSV file? Expired, completed, and overdue enrollments can be uploaded to courses using a CSV file. 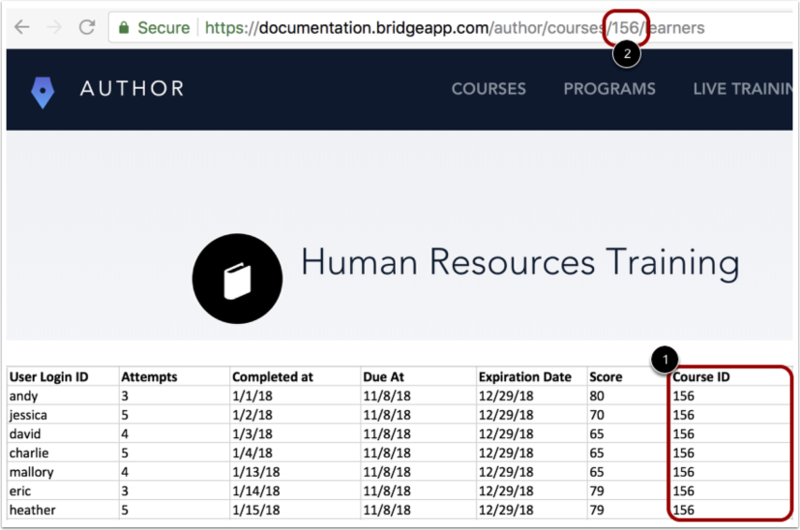 Users can efficiently migrate user scores from previous non-Bridge courses into Bridge so all user data is in one place. The process for uploading a CSV containing data for multiple courses differs from the process of doing so for a single course. Some features may be restricted based on your user permissions. Only users with the Override Enrollment Data permission can upload historical course completion data. All new data will replace existing Bridge data. Notifications are not sent for completed enrollments uploaded via CSV. User Login ID: User Login IDs are case-sensitive and must match the Bridge user's current user ID. This is the user's unique identifier, which defines all account information per Bridge learner. Number of attempts: Attempts must be whole numbers input as numerals (e.g. 13, not 13.5 or thirteen). Completion date: All dates must include a day, month, and year. Bridge will interpret dates in United States formatting, in which the month appears before the day (e.g. 12/31/2017, not 31/12/2017). You can also include an optional time of day in date fields (e.g. 12/31/2017 12:00). Due date: This field has the same formatting requirements as completion dates. Expiration date: This field has the same formatting requirements as completion dates. Score: Scores must be whole numbers between 0 and 100 input as numerals (e.g. 75, not 75.3 or seventy five). 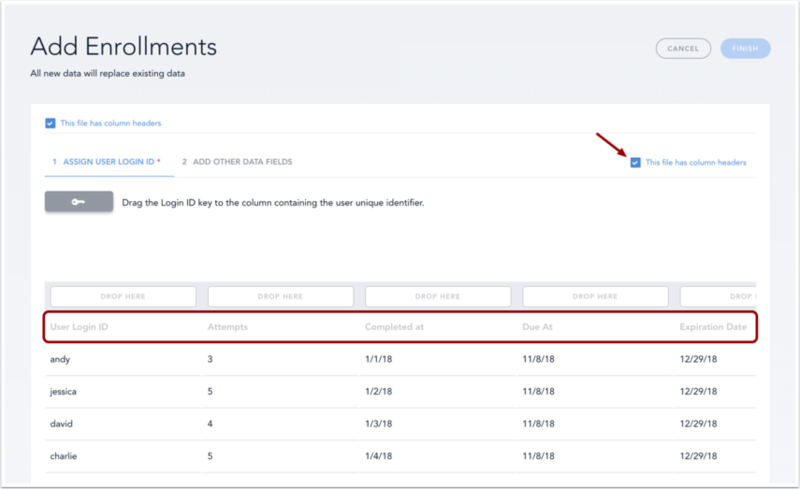 The Completion Date column is optional and only needs to be included if you want to import completion data for the course. 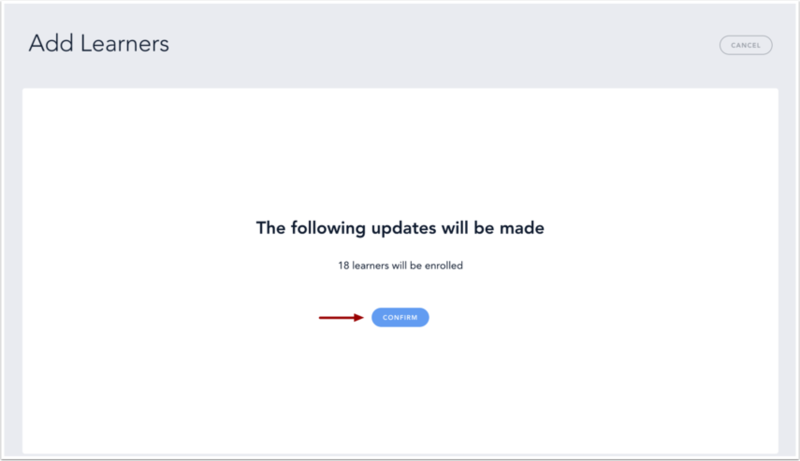 Ensure that you are only adding users that you would like to include in the course. 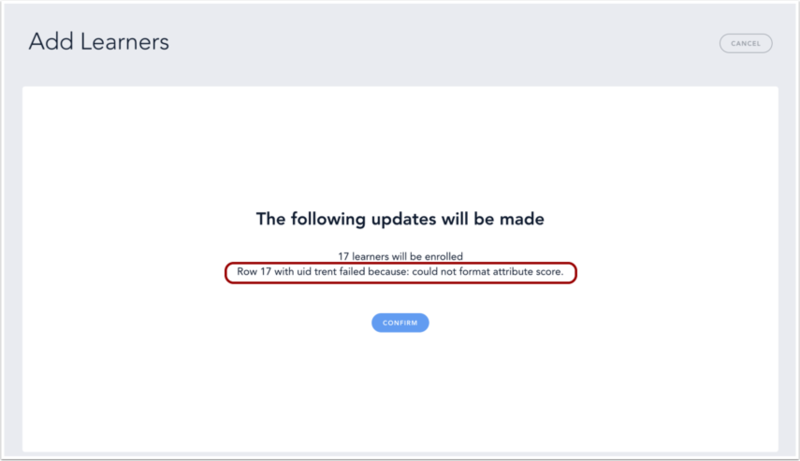 Users added to Bridge incorrectly with historical course data cannot be removed using the Learners tab and can only be removed by a Bridge representative. To upload historical enrollments in multiple courses, you must add a Course ID column to the CSV file . Course IDs must be whole numbers input as numerals (e.g. 13, not 13.5 or thirteen). You can find the Course ID in the URL of your course details page . In the Courses page, search for a course  or open a course . In the Learners tab , click the Add via CSV link . Note: To upload historical enrollments in multiple courses, visit [myaccount].bridgeapp.com/author/course/enrollments/upload. 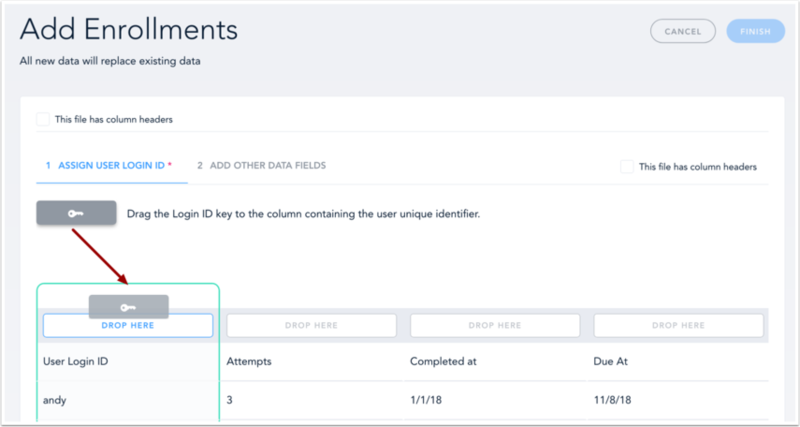 Ensure your CSV has a populated Course ID column. Then, follow the steps below. Drag and drop the CSV file onto the page. You can also browse or choose a file on your computer. The This file has column headers checkbox will be selected by default. If your CSV file does not contain column headers, deselect the This file has column headers checkbox so that Bridge will include the first row of your file. 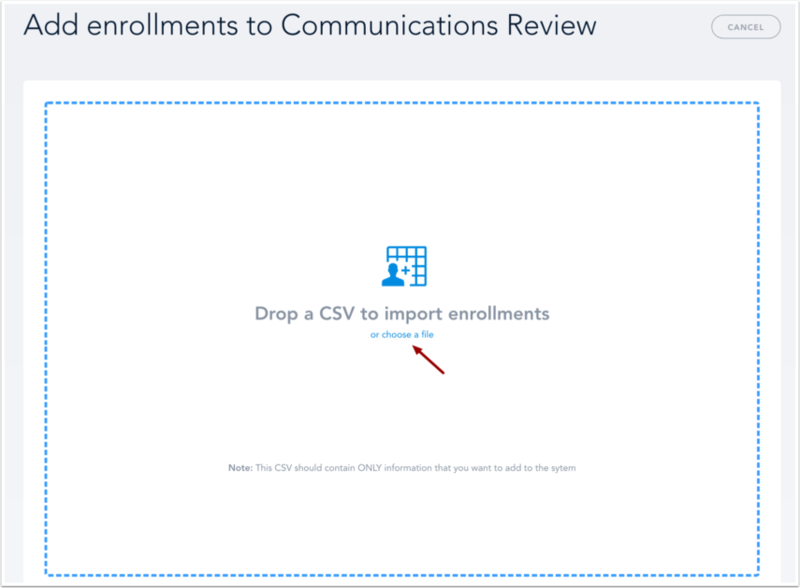 Note: The CSV import page will only allow you to preview five rows of data. All data from the CSV will still be imported. Drag the Login ID key to the column containing the unique identifier (UID), which could be a learner's name, employee ID, or email address. A unique identifier defines all account information per Bridge learner. Match the Bridge format boxes with the columns in your CSV file. Drag and drop the appropriate format box to each column. Bridge will confirm your CSV import and display the status of your import. If there are any errors with your import, you will receive an error message. Note: If there is an error in your import and you click the Confirm button, Bridge will ignore the entire row in which the error appears. If there are no errors in your import, click the Confirm button. Note: The CSV import will run in the background, and may take up to five minutes per 250 uploaded users. You will need to refresh the Learners tab in order to see the imported users. Previous Topic:How do I upload or replace a course package? Next Topic:How do I edit course content? Table of Contents > Manage Courses > How do I upload historical course completion data with a CSV file? Re: can a Historical data csv carry multiple course ID's with completion date? Re: How do I replace a course in a program with a new course and mark the new course as complete if they completed the replaced course?